I’ve never gotten the appeal of fruitcake. Even Carla Kelly’s Regencies with their Christmas pudding never sold me. 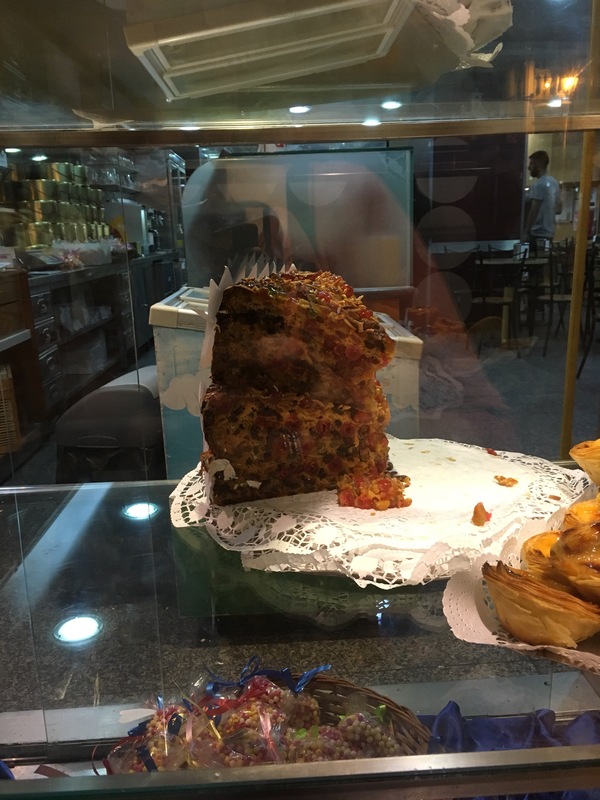 But today I saw the biggest fruitcake I’ve ever seen at a café in Coimbra. 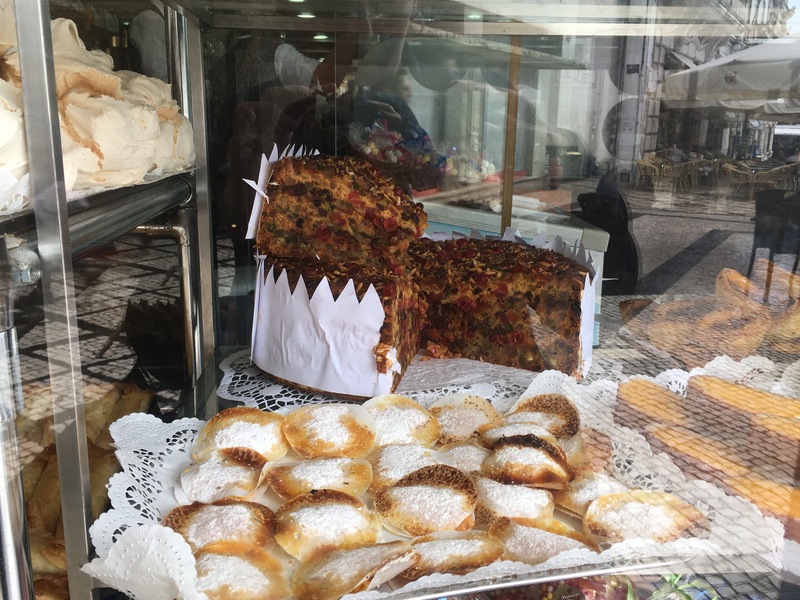 And when I walked past the same pasteleria on my way home after a day of tourist-ing, about 2/3 of it was gone. Which makes me wonder if I’m missing something. Maybe for a coffee break tomorrow I’ll stop in and try it. Or one of the other amazing looking pastries. The DC Metro region is expecting a blizzard. Right now, forecasts say 16 to 30 inches of snow with winds up to 40 mph. White out conditions through Sunday morning. Metro has already announced they are closing up Friday night for the weekend, which may be unprecedented in its history. I have a (relatively pleasant) dilemma. I have tickets to Sunday’s Penguins-Capitals game. Games are almost never canceled. I’m not sure how this game will pan out since the Penguins have a Saturday home game and thus have to fly or drive to DC during the white out. Do I just chalk up the game/tickets as a loss, assuming it won’t be rescheduled, or stay in DC for the weekend for it? It feels irresponsible to be away from home during a blizzard. But it’s not like I’ll be doing anything constructive there. According to LibraryThing, I read or tried to read 42 books this year. Scrolling through the list, a lot of the titles stir only the vaguest of recollections in my mind. The Martian by Andy Weir. As I mentioned on Twitter, I enjoyed this book even more than I enjoyed the movie. The narrative style and the narrator’s voice *made* the book. Penric’s Demon by Lois McMaster Bujold. This is a novella set in her Chalion world, and it made me wish she would revisit it and tell stories based around the other Quintarian gods. Loved it; it prompted re-listening to The Curse of Chalion and Paladin of Souls. Sean Kennedy’s Tigers on the Run left me feeling ambivalent; I enjoyed it while I read it as revisiting favorite characters but I did not love the plot. Simon came across as petty and unprofessional, which was discomfiting since he was the narrator. Non-fiction books King of Russia and The Road Beneath My Feet, both memoirs, were pretty good as entertainment but were not necessarily sterling examples of the craft of writing. I’d recommend them to hockey and music fans but not necessarily to the public at large. On the oops side, glomming Susanna Kearsley was a mistake; some of the books are reissues and are not so good, and none of them stand up to reading in close succession. I’m mostly broken up with Nora Roberts aka JD Robb. I’m looking forward to the new Vorkos-iverse book from Bujold in the spring, but otherwise I’m not sure what’s coming out soon or what I should be looking forward to. There is an author whose voice/style I really enjoy. Or maybe it’s the voice she has given her main character? In any case, I’ve kept up with the series through multiple books, even though pretty much every book has had very noticeable copy-editing blips and some continuity errors. Despite being edited by a Big Name Editor. A novella was self-published recently, and there are a couple of continuity/consistency things that just make me cringe. Is it retconning? I don’t know. But I think I’m at my limit, especially now that the series has moved to hardback; I’m not willing to pay hardback prices for books that make my hands itch for a red pen. There are lots of good things about hockey fandom. There are. But sometimes I forget how young a lot of fandom is. Or maybe young isn’t the right word. Inexperienced? Oblivious to economic realities? DKPittsburghsports.com is a sports news site focused on Pittsburgh sports; it was founded by a former Trib reporter and much of its staff are also former Trib employees or refugees from other traditional media venues. Its material is behind a pay wall. It’s a relatively cheap pay wall, frankly. It has a tumblr where it posts snippets and it occasionally makes full posts free to the public. But some people in hockey fandom have copied entire posts and circulated them. So that other fans (or any random person poking around the internet) can read the copyrighted material while avoiding/evading the pay wall. And when they receive a DMCA notice, they consider the site to be “douchey” because the posters aren’t making money off the reposting and thus there’s no harm. Well, no, the rebloggers aren’t making money. But they are republishing material that isn’t theirs, material that is behind a pay wall. Republishing a paragraph might be fair use, but an entire column is not. The material is NOT theirs to do that with. And they are erasing potential income to the site based on their republishing. That’s not douchey. That is defending their intellectual property and their livelihood.